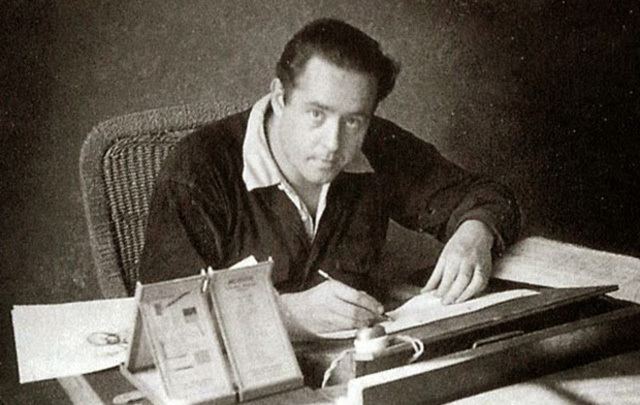 One of my last year's "happiest discoveries", was Frank Tashlin's career as an animator, cartoonist and author. It has been an incredibly rewarding experience to stumble upon this publication, just like Vincent Price's extraordinary cookbook in my previous post. The Bear That Wasn’t (1946)(1) is a critical and satirical fable that discusses the loss of identity in the midst of a booming economy and a challenging society that is based on the use of labels. It is a great book for children but for adults as well. A delightful yet gritty story that will leave an indelible mark. There was a "one-man band" named Frank Tashlin. 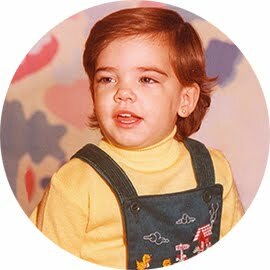 Born in New Jersey, this incredible creator had a hectic and transient career, working practically for every studio during the so-called Golden Age of American animation(2). He gained experience in Van Beuren Studios for RKO, in Leon Schlesinger Studios –that would soon become part of Warner Bros. Cartoon Studios– famous for the creation of the Looney Tunes, and even in Disney. Tashlin wrote, animated and directed several shorts during that time. His insatiable curiosity and his need for transgression, would exude from his every work, aiming to contribute with something new to the emerging world of animation. You can find some of these animated wonder in Cartoon Brew's webpage and by watching the documentary Tish Tash: The Animated World of Frank Tashlin. All animation fans and those who, much like me, are eager to learn more about anything related to cinema, will be thrilled with these suggestions. In 1946 Tashlin, hungry for new challenges, moved on from animation and started as a gag writer for Paramount –one of the few studios he hadn't yet honored with his presence–. Marx Brothers, Lucille Ball or Bob Hope, among others, would get to recite his words. Probably influenced by his animation years, his comical approach is founded on social satire, on popular culture and the alienation from impending production and consumerism. Those issues were reviewed in full previously and were also a basic topic for last century's great comedians. 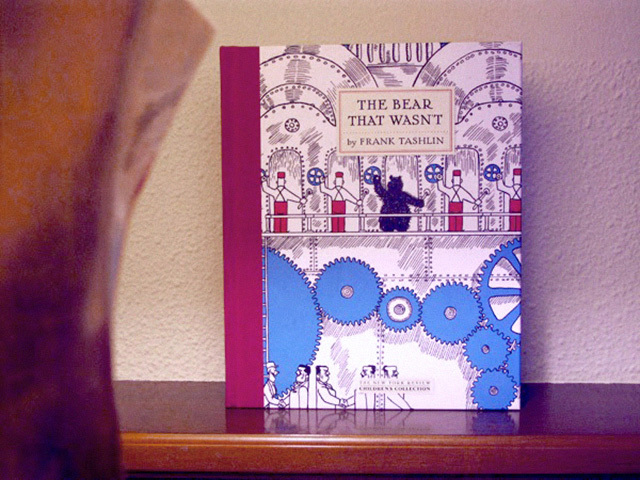 The Bear That Wasn't, is an American classic of children's literature. One day a bear awakens after hibernation to find himself right inside a factory built across the forest. Much to his astonishment, in this new-found home, he is no longer a bear but "a silly man who needs a shave and wears a fur coat". Or so he is relentlessly forced to admit in this environment where he is taken to each of his successive bosses, who try to convince him. More so, even his "fellow bears" would mistake him for a factory worker. The book was written and illustrated by Frank Tashlin in 1946, a year after the end of World War II. Thus, its story is quite an allegory of those times. Through the eyes of the bear, we become aware of the meaning of our own identity. Society, progress and human kind are brutally depicted. As we read on, an interesting and important debate will arise. Indeed, a beautifully devastating tale. 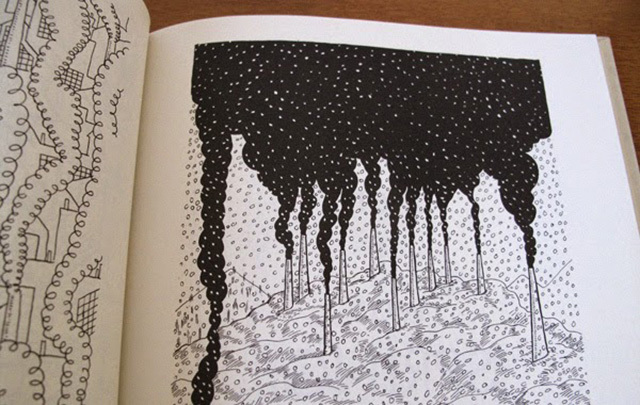 The message of the book is even stronger on account of its powerful illustrations. As opposed to his exuberant and colorful films, Tashlin brilliantly illustrates in black and white, a reminiscent of those old comic strips. This apparent simplicity increases its dramatic effect. A distinctive style, brewing since 1934, with his own comic strip called Van Boring (He Never Says a Word), inspired by Amedee J. Van Beuren –owner of Van Beuren Studios– which he signed using his pen-name, Tish Tash. as published in Los Angeles Times. In terms of cartooning and character design, Tashlin developed his own technique and pinned it as SCOT Art. 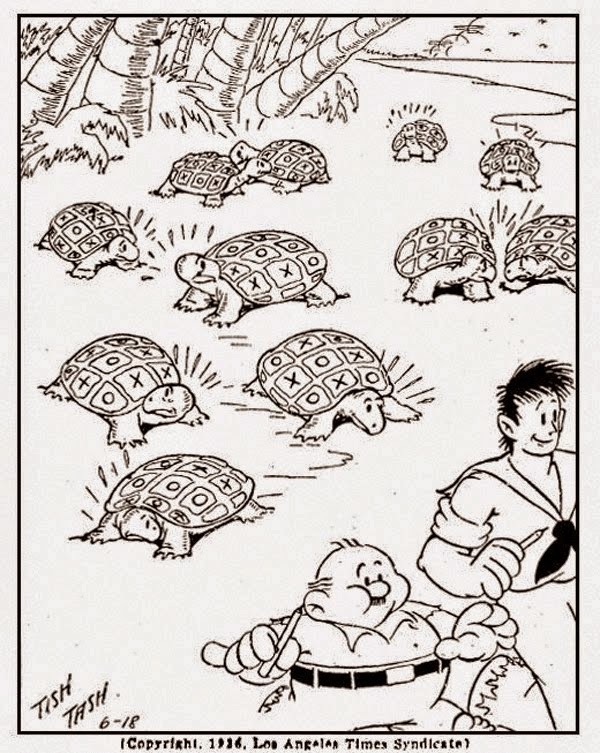 The whole method was explained in the book How To Create Cartoons (1952). Nowadays it is very hard to find, but fortunately we can check it online thanks to Stephen Kroninger. 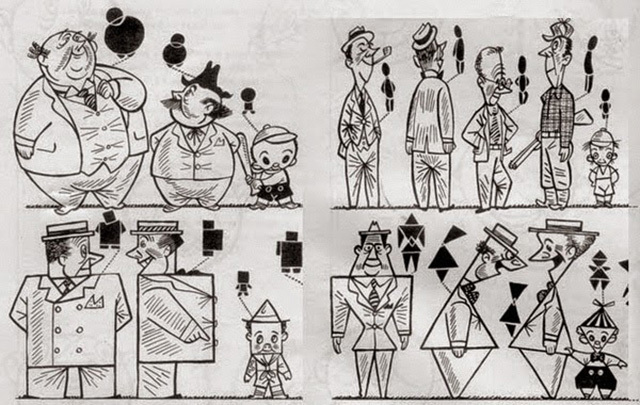 In the booklet, you will get to learn the process by which Tashlin is able to draw any character out of basic geometrical shapes. The square (S), the circle (C), the oval (O) and the triangle (T), can be the basis of any figure. Et voilà. Just follow Tashlin's own advice: “Keep drawing and using SCOT Art putting one form on another and creating your characters. It's like playing with blocks when you put these geometric symbols together.”(3). This formidable drawing guide also provides with the opportunity to have a better comprehension of the comic illustration style of the fifties and to learn a little bit more about the comic strip. Without any exaggeration, this booklet constitutes a true gem of American art history. I believe the time has come when we grab a pencil and give our best shot at genuine SCOT Art. Incidentally, The Bear That Wasn't was turned into an animated short by Chuck Jones in 1967. Contrary to what one might have expected, Tashlin wasn't satisfied with Jones' adaptation. As he explained in an interview with historian Michael Barrier, “[…] Up front in the beginning of this thing, when they are telling him he is a man and he is insisting he's a bear, they put a cigarette in his mouth. Now, the picture was destroyed there, because by the acceptance of a cigarette—you never saw where he got it—by putting a cigarette in his mouth, he was already a man. You know what I mean? Psychologically, the picture was ruined.” In terms of color and scene construction, the animated short is significantly different from the book. In my case, in spite of Chuck Jones amazing talent, I prefer the original blunt illustrations by Tashlin of the printed edition. If you want to compare the work for yourselves, be sure to check the animated short posted on YouTube. 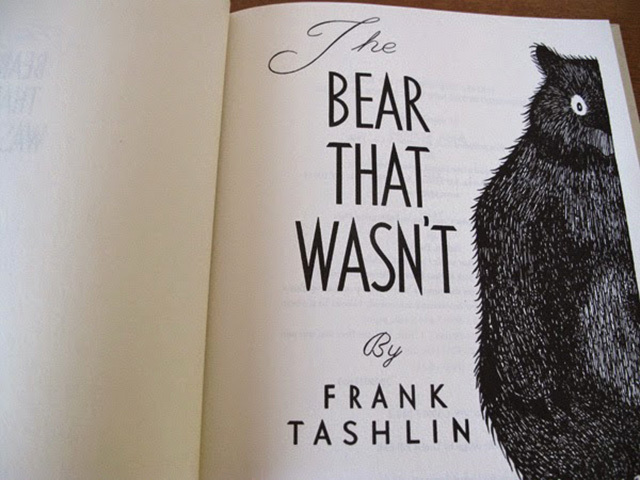 After The Bear That Wasn't, Frank Tashlin wrote and illustrated two more books, equally satirical and double-edged both in argument and in their titles. Those were The Possum That Didn’t (1950) and The World That Isn’t (1951). They are very hard to find but I fully intend to get a hold of them. In the meantime, I would like to recommend you this superb book for children of all ages. (1) The Bear That Wasn't. TASHLIN, Frank. 1946. New York: New York Review Books. Text and illustrations by Frank Tashlin. Available at Amazon.com. (2) Golden Age of American Animation. A period in the United States animation history that began in 1928, with sound cartoons and went on till the sixties. For more information, visit TvTropes. (3) Extract from page 38 of the book How To Create Cartoons. TASHLIN, Frank. 1952. Los Angeles: SOCTArt Publishing Co. Released by Stephen Kroninger in Drawger. Hi there! My name is Miriam Figueras and I grew up watching classic films. Seven Brides for Seven Brothers was my favorite and I think it shows :) Cinema has always been my passion and I enjoy sharing my love through film analysis and reappraisal. Welcome to Cine Gratia Cinema. HIDDEN TREASURES... "It's a Wonderful Life"
Cine Gratia Cinema por Miriam Figueras se distribuye bajo una Licencia Creative Commons Atribución-SinDerivar 4.0 Internacional. Basada en una obra en http://cinegratiacinema.blogspot.com.es/.